We offer a range of honeymoon packages to suit your specific needs and budget. Please contact us at reservations@seriska.com to discuss your requirement. 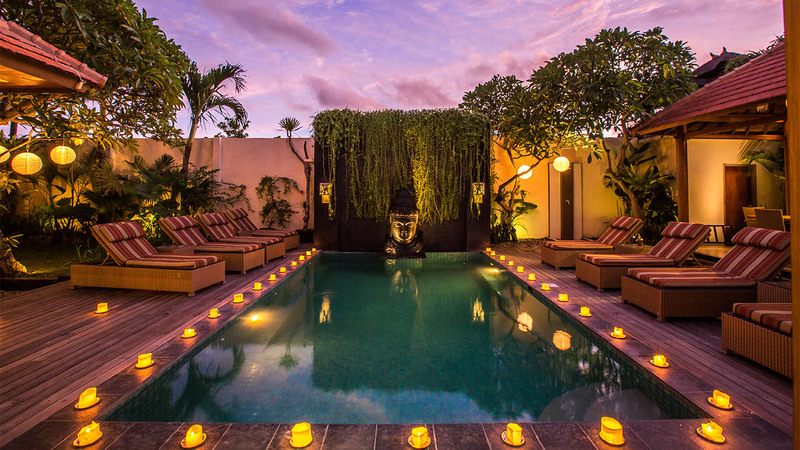 5 nights /6 days accommodation at our luxurious one bedroom villa in Seminyak. A day trip to Ubud, the cultural and arts centre of Bali, for shopping and visiting beautiful art galleries. A tour to the famous Tanah Lot Temple for the magnificent sunset. An adventure tour at Bali Safari to enjoy the animals from all over the world or a day White Water Rafting in the cool rivers of central Bali. A luxurious Spa Treatment for the couple in the privacy of Villa Seriska. This treatment includes a traditional Balinese massage fol-lowed by a herbal body treatment. 6 nights /7 days accommodation at our luxurious one bedroom villa in Seminyak. Professional photo’s taken by our photographer. 250 photo’s burnt in the CD taken at three beautiful Balinese locations: Beach, Rice fields and Traditional Balinese Temple. Professional make-up; hair dressing and beautiful tropical flowers for the photo shoot.